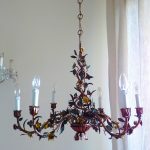 Found in a Tuscanian country house (Italy), this original rare antique chandelier is a gorgeous antique piece of our Italian past. Its structure is made in wrought iron, covered with tiny glass beads. Crystal bobeches and luminous original antique aqua blue Murano drops and Macaroni glass beads swags. in very good vintage conditions with some wear of use. Perfectly working so it is a ready-to-use treasury item. Installation by a professional electrician always recommended. Do not hesitate to contact me for more information or pics. the Murano glass drops will be packaged aside for safety reasons.